In the business world, a boutique could sometimes refer to a simple small business. For example, a boutique talent agency is one that’s considered to be more of a startup. However, if you search for a boutique on Yelp you’ll find an onslaught of clothing stores in your area. 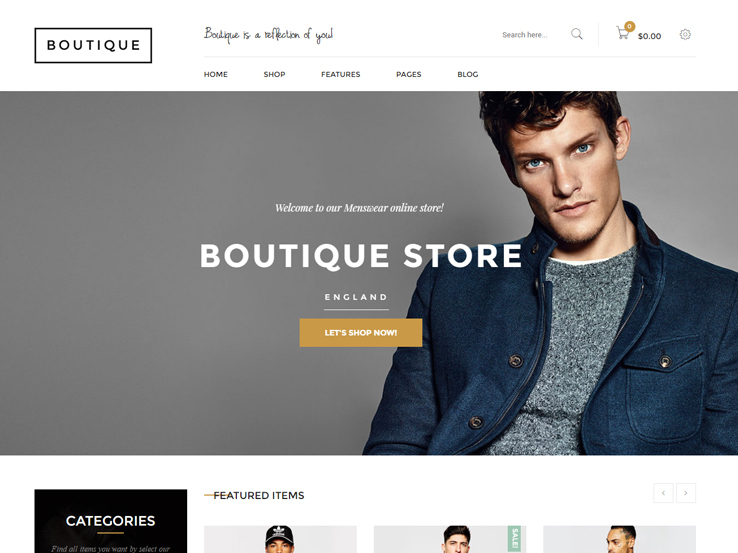 Since that’s generally what people think of when hearing the word boutique, it’s reasonable to assume that a boutique WordPress theme is going to cater to those who are running their own small clothing stores. However, that’s not always going to be the case, so we compiled a list of WordPress themes that address all types of boutiques. Overall, it’s reasonable to assume that boutiques have a certain amount of cuteness to them. You wouldn’t expect to see name brands in a boutique, and the people working there are certainly not going to be a bunch of hired hands by a large chain. Customers would typically refer to a boutique as more quaint and enjoyable than a big store like Kohl’s or Target, and much of it has to do with the environment let off by the store. That brings up the idea of a boutique website. These sites should have a certain creative flair to them, and many are going to offer cute elements that you wouldn’t find on a more professional site. There’s nothing wrong with that either because the product or service you’re attempting to sell is most likely meant to invoke a sense of wonder and playfulness. 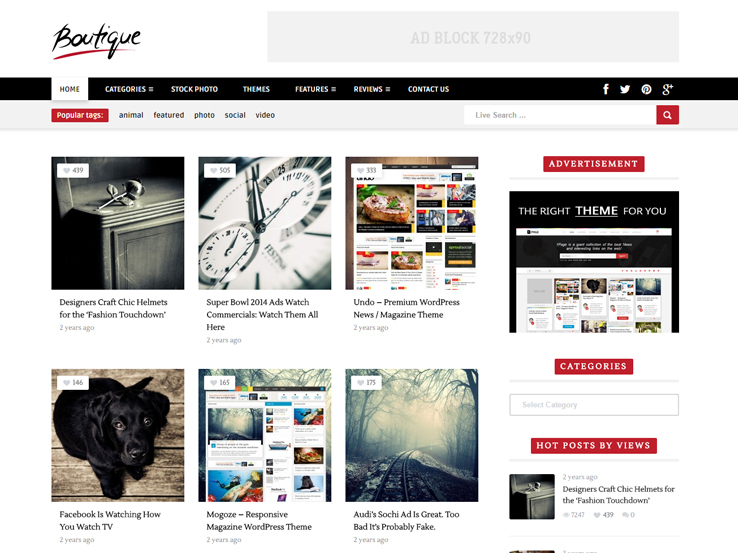 Therefore, your best bet is to go with a boutique WordPress theme. The main reason for this is because there’s no point in reinventing the wheel. 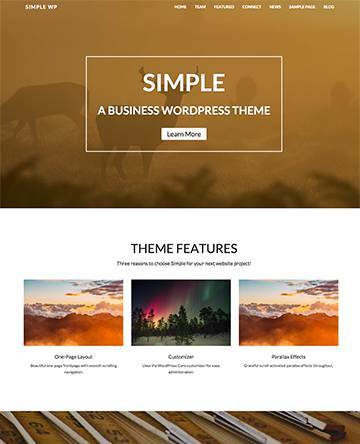 If you’re a beginner developer, you’ll have no chance of designing a website that looks close to one of these themes, and the templates are wonderful for quickly getting setup with and managing the site without any problems. In addition, we like the boutique themes for more advanced developers, since themes are excellent for improving the development process and cutting out any unneeded steps. Therefore, we recommend bookmarking this page and using the suggestions below to round out your own template library. You need a creative theme to make your small business, clothing store, or fashion website looks exceptional. Essence could be a great choice in this case. The template supports multiple menu locations so that the audience always have access to the necessary navigation links. You can make the website look unique by choosing any of the 17 stylish layouts. The promotional boxes on the homepage will be handy to showcase the latest products, services, offers, coupons, or discounts. Need more space for your exclusive items? The multiple featured posts sections should serve you well. Essence is professionally optimized to ensure the best loading speed and SEO results. The Boutique WordPress theme has a simple name, but it’s still packed with a wide range of features that you definitely won’t find anywhere else. 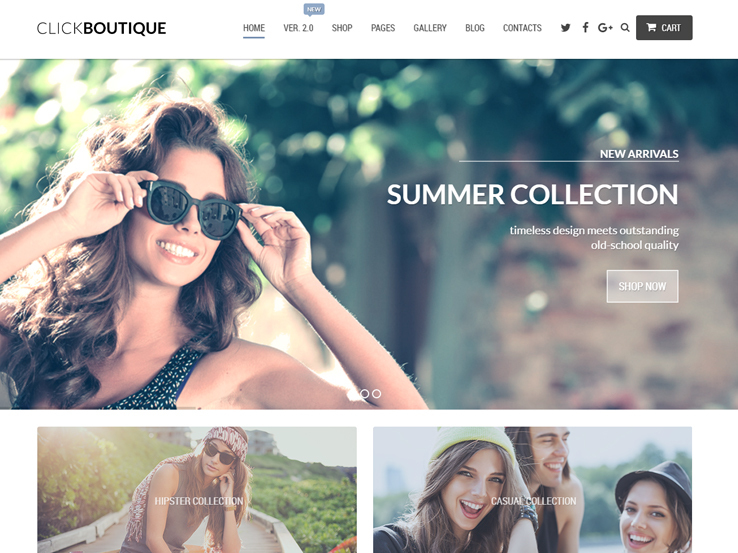 To start off, the Boutique WordPress theme is basically a cute template for fashion companies and blogs. 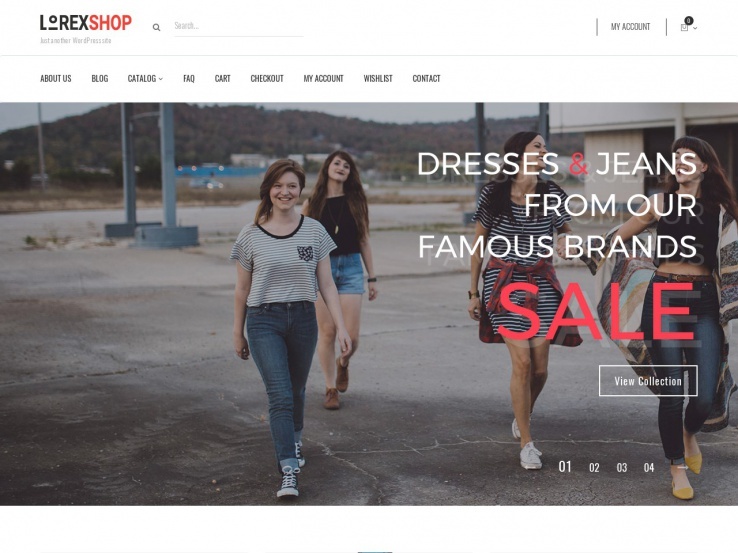 This is a WooCommerce theme, so the plan is to set up a clothing store online to bring in money and show off the hottest fashion trends. The theme is completely responsive for people who are viewing your site on the go, and the 20 pre-made homepages improve your chances of quickly getting a website launched with no problem. A mega menu is packaged into the Boutique WordPress theme, which is ideal for fitting a decent number of pages on your website. One of the big problems webmasters have with eCommerce stores is that they’re usually packed with categories and products. The mega menu gives users direct access to all of these. 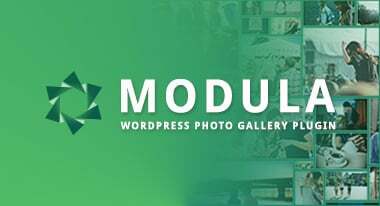 Featuring your products on the homepage is no problem with the theme since it provides various widgets and modules for displaying the most important ones. For example, you may want to list a full set of your product lines in a simple slider, prompting people to click through and buy more. What’s interesting about the homepage and all of its modules is that it has several animations, effects, and tools for making your products stand out. For example, if a user scrolls over one of your products it’s going to present a highlighted effect to present the item in a better light. The multi-grid format is also essential for displaying your products in a professional fashion, with thumbnail imagery and small descriptions to get people excited about the products. Choose from unlimited color schemes, and match up your colors with that of your logo. 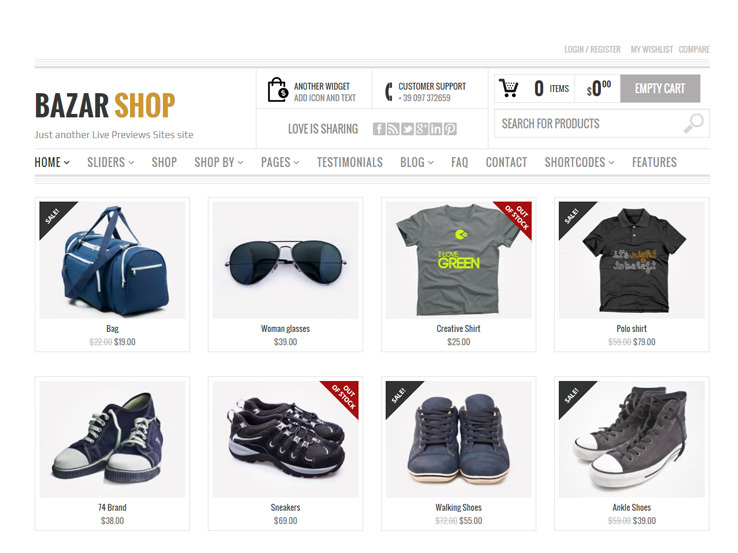 Multiple product page variations come along with the Boutique WordPress theme. For example, you may want to implement a product image zoom or a little sidebar for additional information. 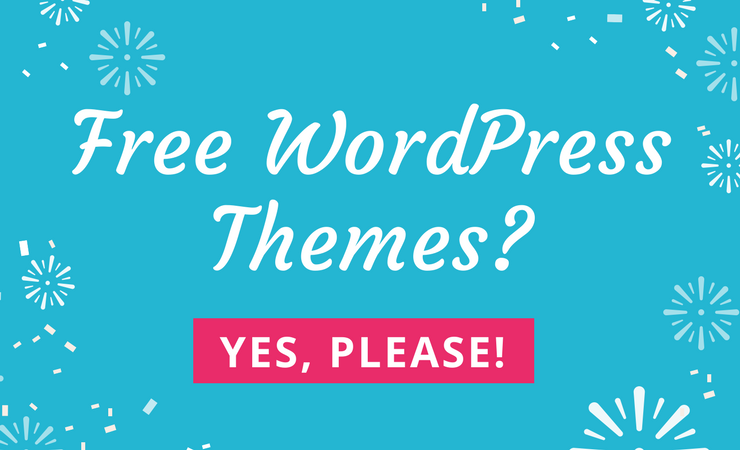 Not only does the theme have support for multiple languages, but you receive two premium plugins for free. The first one is the Slider Revolution plugin, which gives you tools for having the ultimate slider. The other is the Visual Composer plugin, an option that turns the back end of your website into a beautiful drag-and-drop interface. 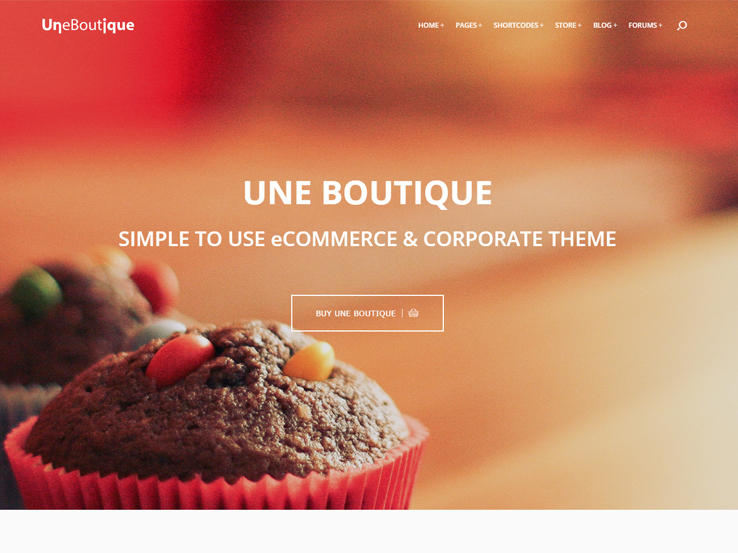 Check out the Une Boutique WordPress theme for the ultimate display of eCommerce prowess and elegance. Although the theme can be used for a more corporate environment, we like it best for constructing a website that caters to boutique customers. The theme is completely responsive, and the Visual Composer plugin (which comes for free) is also responsive if you plan on developing your site with a drag-and-drop editor on a phone or tablet. Slider Revolution is yet another premium plugin that you receive when purchasing the Une Boutique WordPress theme. The main reason we like the Slider Revolution plugin is because it allows for overlaying text and buttons, prompting users to click through and look at new products. What’s more is that the Essential Grid plugin is provided for free as well. This means you can construct grid-based portfolios and galleries, which is great for online stores with advertisements, promotions, and events. It seems as if everything is possible with the Une Boutique WordPress theme, since you gain access to a beautiful Parallax effect, along with various other hover effects and icons. Numerous shortcodes come along with the purchase as well. These shortcodes are known to keep your hands free of any actual source code, meaning that you won’t have to know that much about coding in the first place. Overall, making a slider, button or column with a shortcode is as simple as a quick copy and paste. The homepage actually looks somewhat similar to a one-page layout, even though you receive a regular, multi-page theme with your purchase. However, the rows and modules on the homepage are reflective of what you would find with the typical one-page setup. For example, one of the rows is dedicated to talking about your workers. You can show off photos, titles and descriptions of these people to give them the credit they deserve. You’ll also find some social media buttons for keeping your social game intact, and the contact form is essential for maintaining a relationship with customers who come to your site. 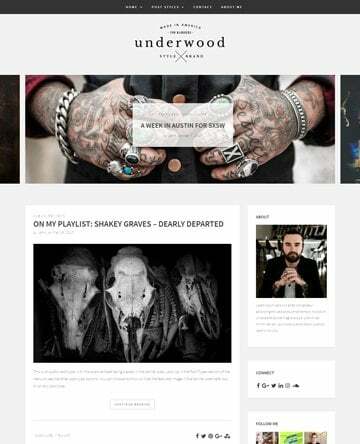 Overall, we like the look and feel of the Une Boutique WordPress theme. It helps out with selling products, yet it still provides a beautiful boutique elegance about it. 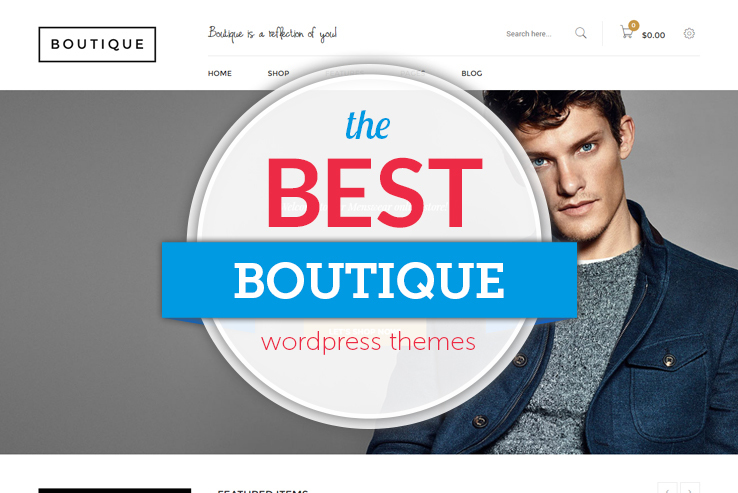 The Boutique WordPress theme is a great choice for creating small- to mid-sized websites for your niche business. Modern design and unique layouts will keep the main focus on your products and maintain an excellent user experience. Needless to say, you get full WooCommerce support for selling different items right from your website. The package includes both Visual Composer and Slider Revolution, two of the essential premium plugins for any modern website. Thanks to the fully responsive, Retina-ready design, your website will look great on all screen sizes. As the name clearly indicates, Alice’s Lingerie Store and Fashion Boutique is specially made for fashionable lingerie and clothing sites. There are several readymade pages to help you get started. It is also possible to use the built-in drag-and-drop builder for creating customized post and page designs. The dedicated shortcodes will be very useful for adding different elements to your website. Parallax effects will bring life to your boutique store’s background. Other notable features include sticky menu, mega menu, multi-language support, Google Fonts, Google Maps, and WooCommerce support. 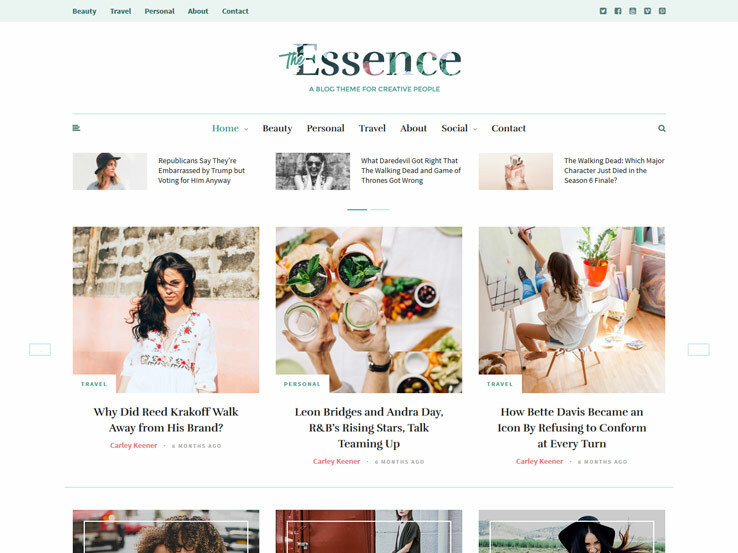 This premium WordPress theme features full compatibility with WooCommerce and comes with all the necessary features for creating fashion, clothing, and boutique websites. Lorex is developed on the Bootstrap framework, which means your online shop will work on all screen sizes and resolutions. There are six professionally designed category pages, which could be very useful to showcase your available products. Since the developers have adhered to standard web best practices while creating this theme, you can rest assured that your website will look great on all modern browsers. 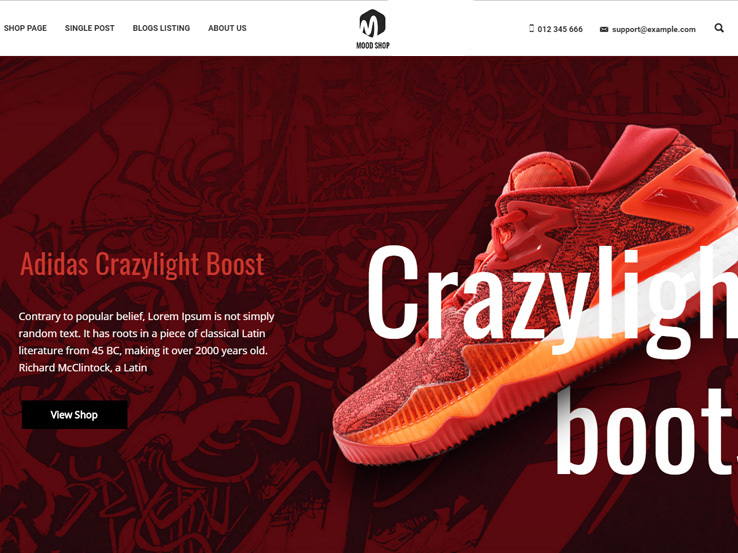 MoodShop is a stylish e-commerce theme that is mainly developed for selling footwear or other related items online. There are multiple homepage designs to help you feature the latest products, show your address, and highlight special events or promotions on the homepage. Fully customizable category pages allow you to display products in unique ways. The built-in drag-and-drop builder will help you to create custom layouts for your posts and pages. Features like product “Quick View”, AJAX-powered “Add to Cart”, and a wishlist will bring increased conversions. The package also includes a few premium plugins and an extended documentation. When you have a template like Bary, it becomes a lot easier to sell clothes, shoes, watches, or other fashion items from your website. Thanks to the eye-catching ready-made designs for the homepage, shop, and product pages, you can get started fairly quickly. Feel free to use the built-in mobile-optimized mega menu to ensure the best navigation for your visitors. Looking for an interesting way to highlight the latest or best-selling products? The product slider module will be the best choice for you. 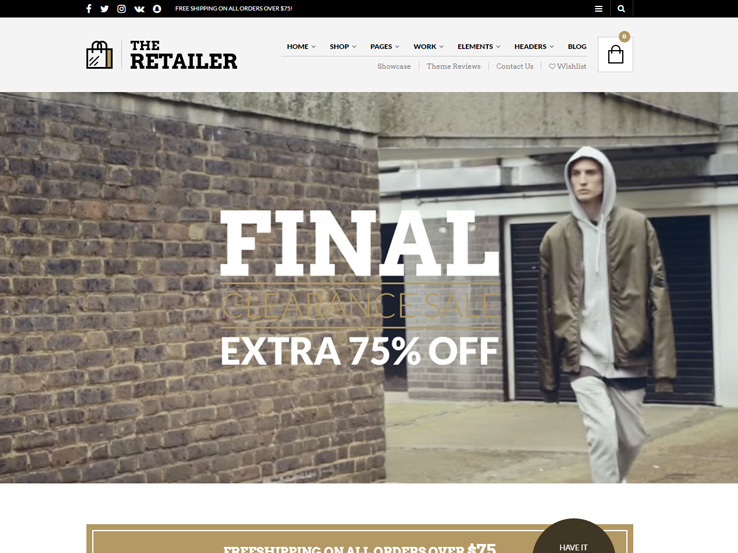 Quick product view, AJAX “Add to Cart”, and brand logos will land you more sales. 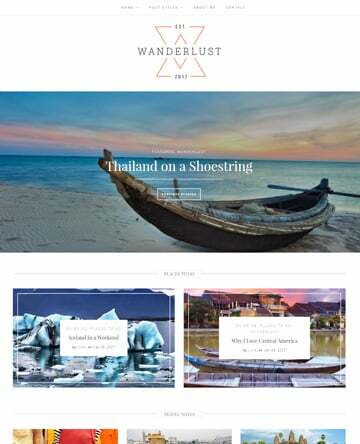 This highly popular multi-purpose WordPress theme could be an excellent choice for developing fashion, beauty, clothing, boutique, or any e-commerce site. A live page builder and the huge element library will help you create the exact page structure you want. The theme customizer section allows you to make changes and check out the preview at the same time. 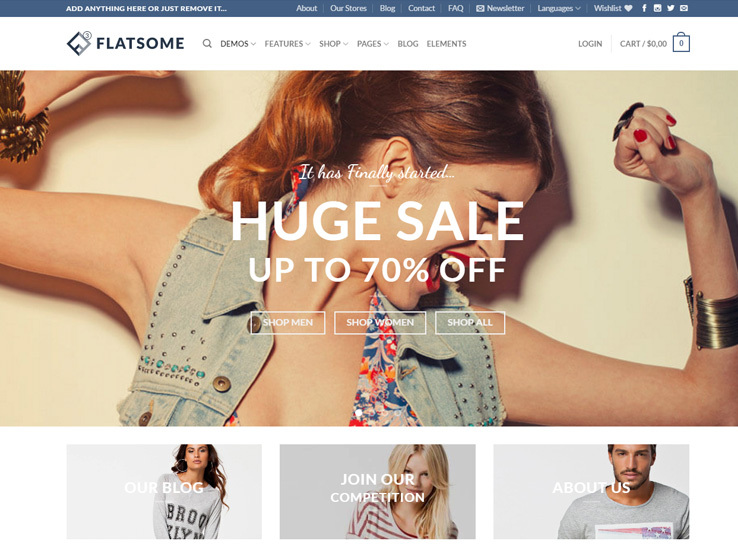 Flatsome is provided with several professionally designed product and category pages along with built-in live search, catalog mode, quick view, and off-canvas cart. The multilingual theme works perfectly with WooCommerce, which means you can create boutique sites in any language. Creating a fashion or boutique website requires a discreet approach to styling, and The Retailer offers exactly that. This top-selling template comes with a large number of ready-to-go page layouts and a complete set of demo data. You can use any of the existing designs or utilize the built-in page composer to create your own. You can display products in various colors, sizes, or other necessary attributes. With complete support for the popular payment gateways including credit cards, PayPal, and cash on delivery, it is possible to accept payments from your customers. The developers knew exactly what they were doing when they created Bazar Shop. 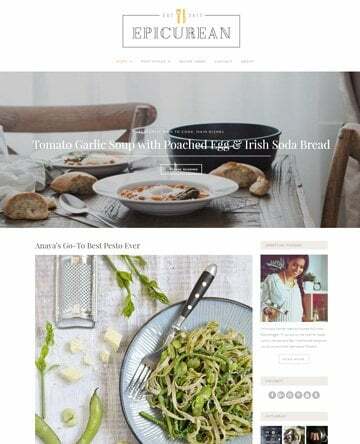 This incredibly popular theme features conversion-oriented designs right from the homepage, leading to the product details and shopping cart pages. Customers can compare multiple products, add any product to their wishlist, and share products on various social media networks. There is a number of custom widgets to show the featured products, product categories, customer reviews, cart, blog posts, and email subscription form on the sidebar or footer. Your purchase also includes several premium plugins, dedicated shortcode manager, mega menu, and popup support. 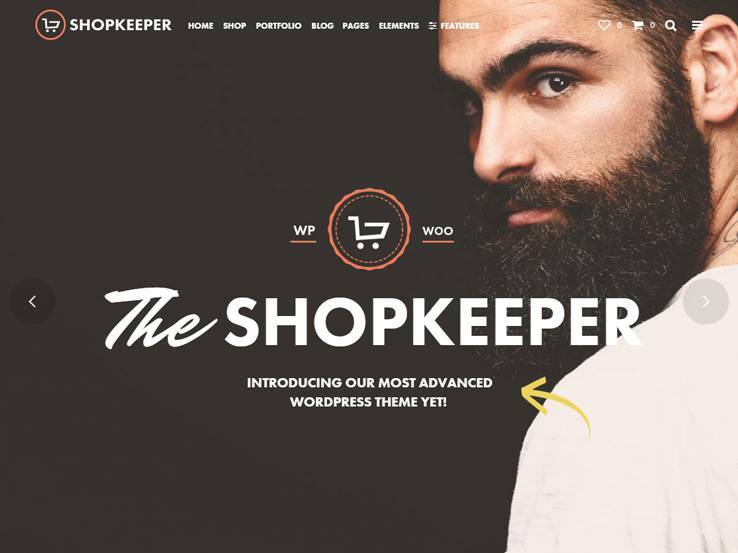 The aptly named Shopkeeper theme is provided with several homepage variations, offering a solid start for your fashion, clothing, or boutique site. Features like simple cataloging, inventory management, and complete payment method integration will help you establish a reliable shopping experience for the visitors. Shopkeeper enjoys several unique features, like the shipping calculator and a built-in order tracking system. Potential customers can sort the products by using various filters like size, color, price, and so on. The detailed tax and shipping options will take care of the legal aspects and ensure timely delivery. 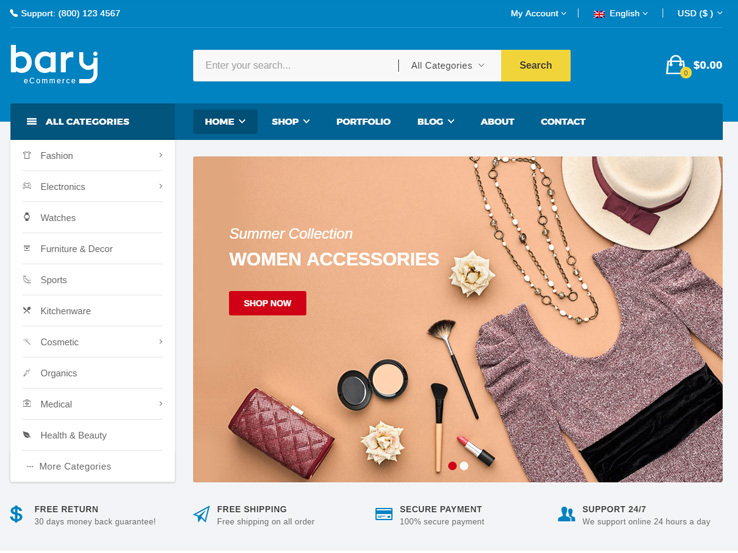 The simple but effective homepage design of Click Boutique includes all the necessary sections, like an attractive slider, the latest collections, latest products, and popular brands, along with featured and discounted products. The WooCommerce-supported theme is based on Bootstrap, which ensures that your online store remains perfectly usable from all devices. You can stick to the default color schemes or create your own. Parallax backgrounds will spice up your content, while the integrated page builder allows you to create custom layouts. As Click Boutique is WPML-ready, you can use the theme to create boutique shops in other languages as well. Looking for a modern, trendy design for your boutique shop? 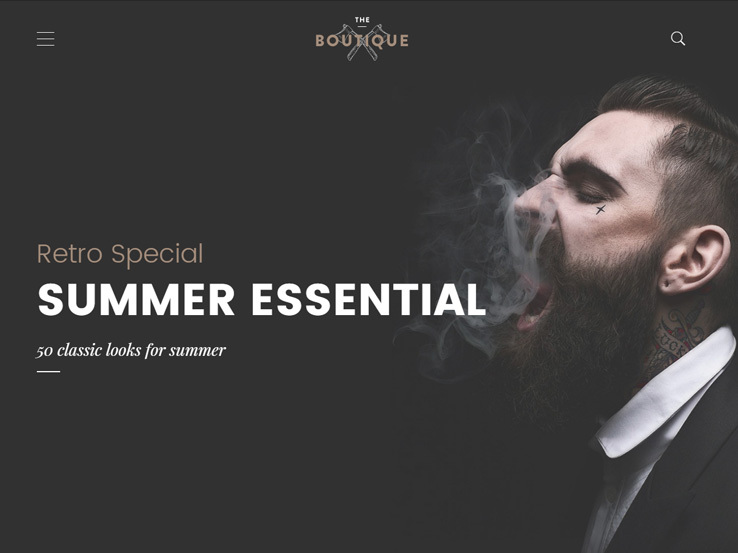 Why not try La Boutique, a gorgeous, multi-purpose WordPress template with impressive user experience? It comes with Isotope’s lovely jQuery animation plugin and 360+ Retina-ready icons from FontAwesome. You also get access to 16 professionally created color schemes and superior typography options. La Boutique is fully compatible with WPML and Visual Composer, which means you can create fully customized boutique sites in any language. The built-in mega menu supports images, videos, maps, forms along with the regular navigation items. The guest checkout feature will help the visitors finish the transaction easily. Boutique Grid could be another interesting choice for your fashion, beauty, or clothing store. The theme enjoys a clean, simple design that works perfectly on all screen sizes. Customers can use the live search feature to find their desired products. The tags and category index could also be useful in this case. With full support for Google snippets, your content will look great on the search result pages. 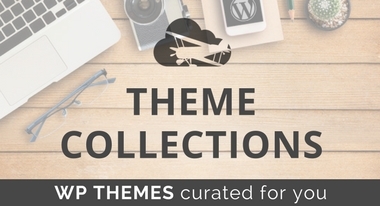 The fully featured theme options panel includes all the necessary customization options. The translation-ready theme also comes with several custom widgets and lots of shortcodes. 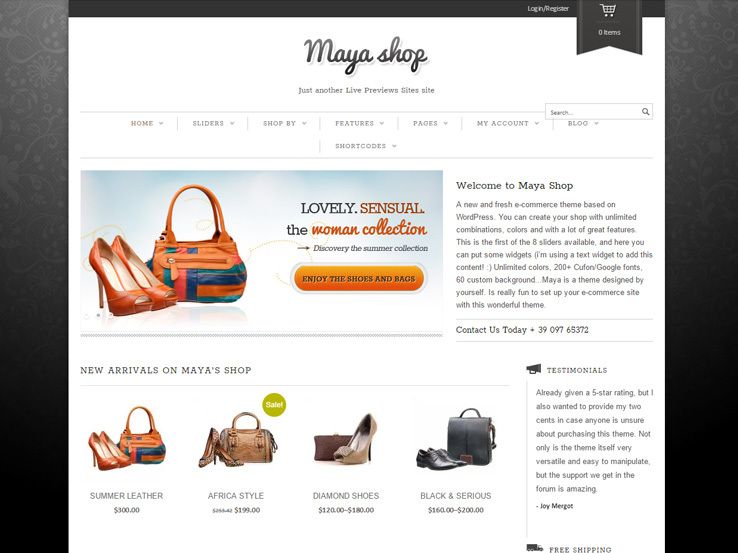 MayaShop is a traditional but effective WordPress template for creating clothing, shoes, watch, or any other boutique and small business websites. You can choose from the boxed or full-width option and create your own color skin. Customers can zoom the products by hovering over the images and add products to the wishlist. There are dedicated social icons to help them share the products on various social media platforms. Integrated shortcodes and custom widgets will come in handy for customizing the homepage. Other interesting features include multiple slider types, mega menu support, and unlimited product attributes. The Boutique Kids WordPress theme is a wonderful place to start this list because it provides a beautiful and creative WordPress theme with integration possibilities with WooCommerce. You would probably only select this theme if you plan on having an online store since the eCommerce design is so excellent. All of your products can be featured on the homepage, and a beautiful product page is provided for each of the items you plan on selling. In addition, it only takes a few minutes to connect the theme with your payment gateway, in turn generating income for you a little earlier than usual. The Boutique Kids WordPress theme offers a stunning responsive layout, which comes in handy for users who are going to be looking at your content through mobile devices. The easy sidebar management is always a bonus, considering you’re going to be working with a decent number of widgets. 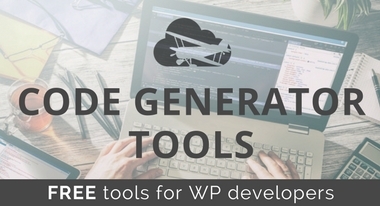 Since these widgets are so powerful and important to the overall construction of the website, it’s nice to have some familiarity with WordPress before getting started. The easy image slider is yet another reason for choosing this theme. It allows for beautiful imagery in the upper part of your website, and you’re basically given the ultimate means of communicating about new products, events, and promotions. The blog and post layouts launch your SEO to the next level. Not to mention, the amount of people who come to your site on a regular basis is bound to increase when you have a blog. Just remember to switch up the blog post formats from time to time to keep users interested. The easy theme customizations are all done on the backend. For example, you can change around some colors and implement the translation files within seconds. These help you to reach out to people who may not speak your language. You can change colors, styles and positions with the click of a button, and the over 200 icons are there for adding some spice to your layout. The easy to use shortcodes offer wonderful options for improving on the amount of website elements inserted on your website. For example, some of the shortcodes help out with buttons and columns, both of which come into play for selling goods on your online store. 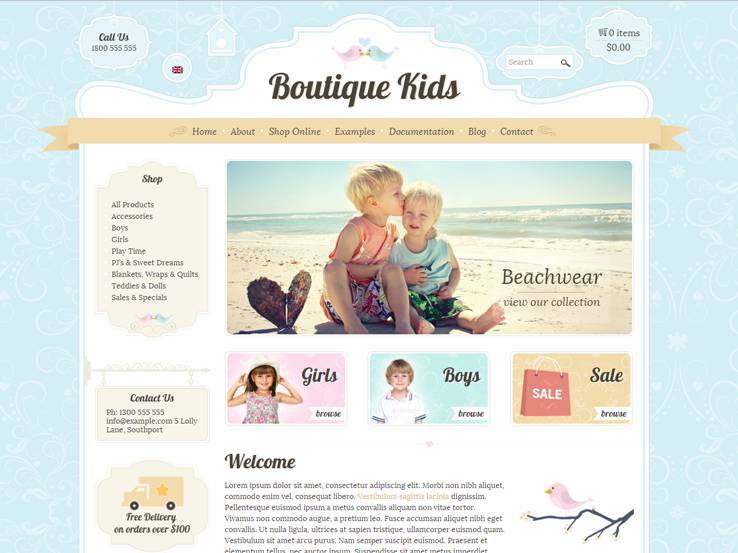 Overall the Boutique Kids WordPress theme comes in as one of the top solutions for boutique websites.